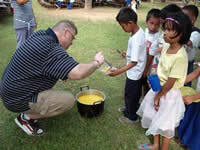 Be A Hero Now -- Feed a poor child -- a ministry of Global Outreach Family Ministry, Inc. Select your preference below for sponsoring a child -- a Boy or a Girl or Either -- or make a One-Time Donation for sending a box of donated items or for general ministry needs. Your support of this vital outreach is very much appreciated. If you want to donate by Check or Money Order, make them payable to: GFOM, P.O.Box 31, Attica, NY 14011. All donations and gifts are tax-deductible under IRS regulations 501(c)(3). Your gift of $30 a month will allow us to feed and share the Gospel of Christ with one young girl. We work in both inner city Manila and in the poorer sections of the Philippines to reach the unreached children with salvation and practical helps. Your gift of $30 a month will allow us to feed and share the Gospel of Christ with one young boy. We work in both inner city Manila and in the poorer sections of the Philippines to reach the unreached children with salvation and practical helps. Your gift of $30 a month will allow us to feed and share the Gospel of Christ with one young child. We work in both inner city Manila and in the poorer sections of the Philippines to reach the unreached children with salvation and practical helps. 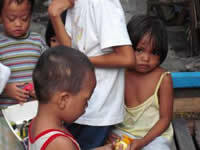 We provide pastoral care to the poor children of inner city Manila as well as the neediest areas of the Philippines. We share the ospel of Christ as we meet the practical needs of these poor children in school settings as well as churches. Your gift of $125 will allow us to send a box of donated clothing, food, and other items. We work in both inner city Manila and in the poorer sections of the Philippines to reach the unreached children with salvation and practical helps.